This entry was posted in News and tagged Community Commitment, Foodbank of Santa Barbara, News on November 30, 2014 by Judith Smith-Meyer. The Foodbank of Santa Barbara County is pleased to announce the launch of its new and improved website, featuring a growing collection of interactive tools and resources for the entire community. Highlights of the new website include the Foodbank’s new blog, “The BEET: All Things Nutrition,” making the Foodbank’s award-winning nutrition education approach accessible to the entire community, and the Foodbank Guide to Nutrition Programs in an interactive map of countywide hunger-relief and resources. Authored by Erin Hansen, RDN, the Foodbank’s community nutrition coordinator, “The BEET” provides readers with access to nutrition news, “Myth Busters,” healthy recipes, guest expert interviews and other tools to incorporate nutrition into their families’ daily lives. With nutrition credentials, Hansen provides sound, science based nutrition information to the community in a fun and “digestible” way. The BEET publishes throughout the month and features interviews with restaurant chefs, farmers, nutrition professionals, and health and wellness innovators. The BEET Myth Busters combats nutrition fallacies; and The BEET Recipes shares healthy recipes from Foodbank programs that utilize our local bounty of fruits and vegetables. This week’s blog includes an interview with Talkin about his own family’s Thanksgiving traditions. Click here to subscribe to The BEET. Also new to the website is Foodbank’s Guide to Nutrition Programs. This interactive feature assists organizations countywide to assist those facing hunger and poor nutrition through interactive maps highlighting hunger-relief and nutrition resources throughout the county. 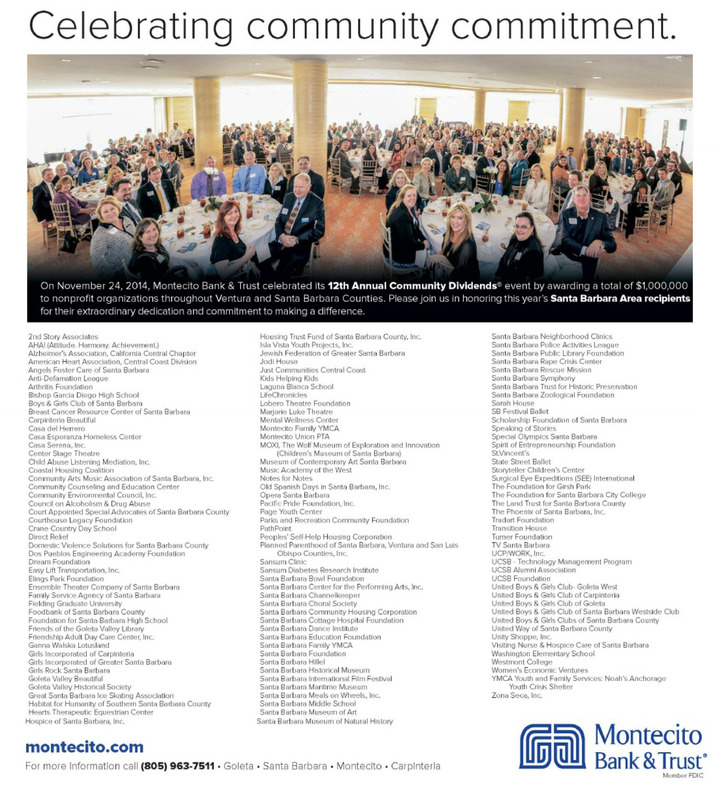 The Foodbank’s Community Partners section highlights the organization’s network of over 330 nonprofit partners throughout Santa Barbara County. With the structuring of Foodbank’s Community Impact Department, Foodbank has evolved from just supplying nonprofit partners with food for their programs and running direct-to-client programs to filling gaps in key unserved nutritional and educational needs. Viewing food banks now as public health organizations working to keep people healthy and nutritionally independent, Foodbank is also using new public health evaluation tools to measure the effect of these interventions in the community. 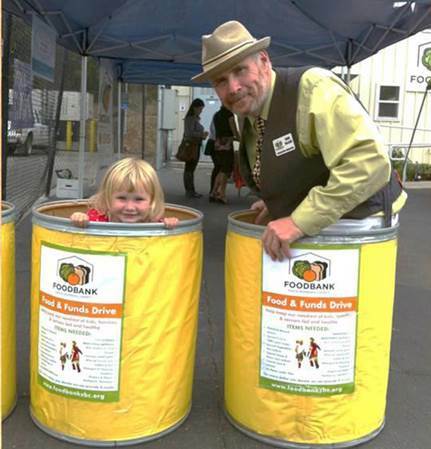 In 2013, 144,000 unduplicated individuals were provided with nourishment and education through Foodbank’s award-winning programs and its network of over 330 social service programs and agencies, churches and community groups from Carpinteria to Santa Maria. 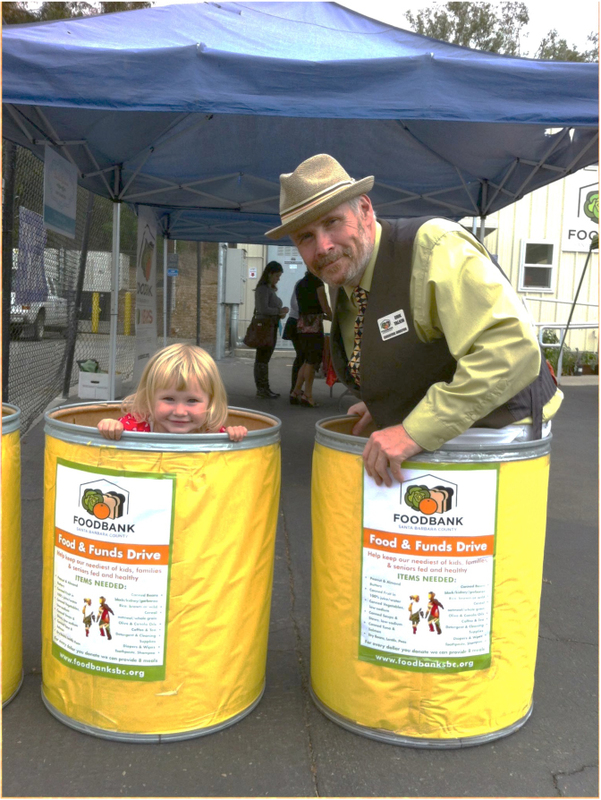 The Foodbank of Santa Barbara County is transforming health by eliminating hunger and food insecurity through good nutrition and food literacy. The Foodbank provides nourishment and education through its award-winning programs and a network of over 330 member non-profit partners. In Santa Barbara County, one in four people receive food support from the Foodbank; over 144,000 unduplicated people of whom nearly 40 percent are children. Last year, the Foodbank distributed 9.3 million pounds of food — half of which was fresh produce. — Candice Tang Nyholt is a publicist representing the Foodbank of Santa Barbara County. 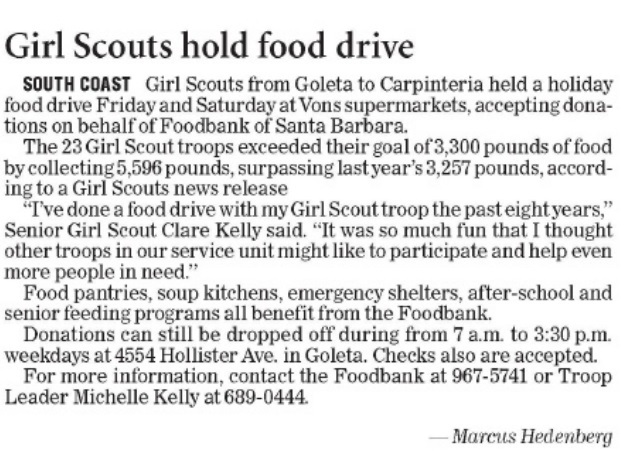 This entry was posted in News and tagged Events of Santa Barbara County Foodbank, Foodbank of Santa Barbara County, News on November 27, 2014 by Judith Smith-Meyer. 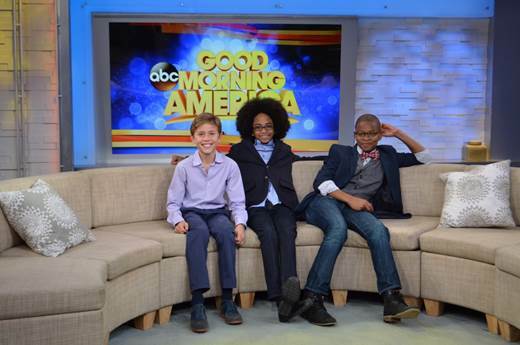 This entry was posted in News and tagged News on November 27, 2014 by Judith Smith-Meyer. This entry was posted in News and tagged Foodbank of Santa Barbara, News on November 27, 2014 by Judith Smith-Meyer. Four-year-old Amy is a self proclaimed fan of pears. She loves learning about fruits and vegetables, and especially enjoys participating in fun activities like making recipes with her family using fresh produce from Foodbank’s Food Literacy in Preschool (FLIP) program. FLIP serves a dual purpose: delivering short-term food assistance and providing nutrition education. Amy is one of the 24 preschoolers (plus 20 toddlers) who attend Storyteller Children’s Center, a childcare center for homeless and at-risk children from 18 months to 5 years of age. Every month, she looks forward to Foodbank’s FLIP program held at Storyteller. “I liked making apple juice and apple spirals last time and today’s pear smoothie is yummy,” said Amy. On a recent Thursday, as crisp fall fruits come into season, the kids at Storyteller received a hands-on lesson in crafting a healthy pear snack. Gathered around a munchkin-sized table, the kids eagerly descended on the bounty of fresh, local Comice pears – sourced and delivered by Foodbank. This is one of the few times during the month Amy gets this type of exposure to fresh fruits and vegetables. Amy is one of nearly 50,000 local children who are provided with nutritious food and education through Foodbank direct programs or Foodbank’s 330+ nonprofit partners like Storyteller. Many families in Amy’s situation wish they could eat more fruits and vegetables, but might not initially buy them on their own because of the expense. And 71% of families served by the Foodbank must make heartbreaking choices of buying food or paying for housing, utilities, transportation, clothing and other basic necessities. After each month’s FLIP lesson the children get to take home a bag of the featured produce to their families. FLIP is the first step in Foodbank’s “Feed the Future” continuum of programs, and helps drive one of the Foodbank’s key strategies: to reach families in our communities through their children. Kids bring their new-found knowledge – and in the case of FLIP, the fresh produce – back to their families, inspiring families to come together to try out new recipes and eat more nutritiously. FLIP is currently offered at six school-based, preschool and early childcare centers throughout Santa Barbara County. 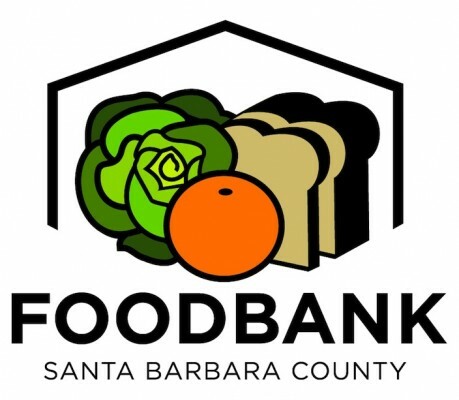 Locally, Foodbank of Santa Barbara County serves 144,000 low-income, below federal poverty level individuals in Santa Barbara County (one if four of our total population), many of them working families, children and seniors. For more information about FLIP and other Foodbank programs, visit www.foodbanksbc.org. This entry was posted in News and tagged Foodbank of Santa Barbara County, News, Outreach on November 26, 2014 by Judith Smith-Meyer. This entry was posted in Guest Expert Interviews, The BEET and tagged Erik Talkin, Foodbank of Santa Barbara County, Thanksgiving on November 25, 2014 by Judith Smith-Meyer. Members of Garcia Dance Studio perform during the first Santa Barbara County Cooperatives Festival on Nov. 8 in Lompoc. The first Santa Barbara County Cooperatives Festival was held this month in Lompoc, and organizers say the event was a spectacular success. 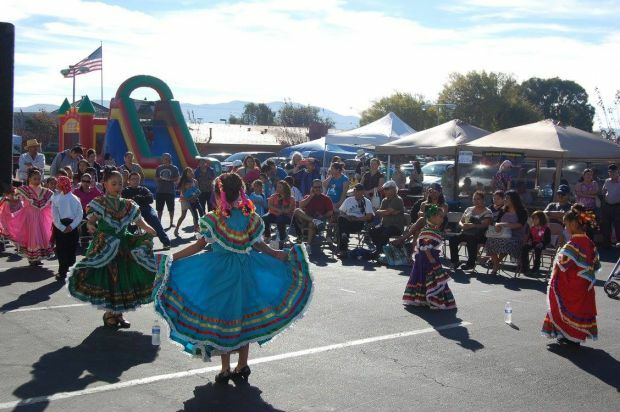 About 400 people attended the festival, which took place at the Northside Shopping Center on Nov. 8. The event, which was presented by eight local cooperatives, was vibrant with dance performances of varying flavors and joyous live music. In-Shape Health Clubs and Fund for Santa Barbara, the host Northside Shopping Center and Blanca Figueroa, who served as the event’s emcee. Also contributing were: the DelaPalma family with its bounce house; Garcia Dance Studio; Danza Azteca Xochitl; Grupo Folklorico el Sabor de Mexico; Calah & Sergio and Bing Aradanas, who performed; Apostolic Assembly Church; Food Bank of Santa Barbara County; Alliance for Pharmaceutical Access; Dorothy Jackson Family Resource Center; LUSD Dual Immersion Magnet Program; Nuestra Gente Pageants; Santa Barbara County Migrant Education Program; League of United Latin American Citizens; Lideres Campesinas; Santa Barbara County Action Network; Promotores de Salud; Lompoc G.I. Forum and G.I. Forum Youth; Santa Barbara Society of Friends; and Rosalba Bello, beauty consultant. 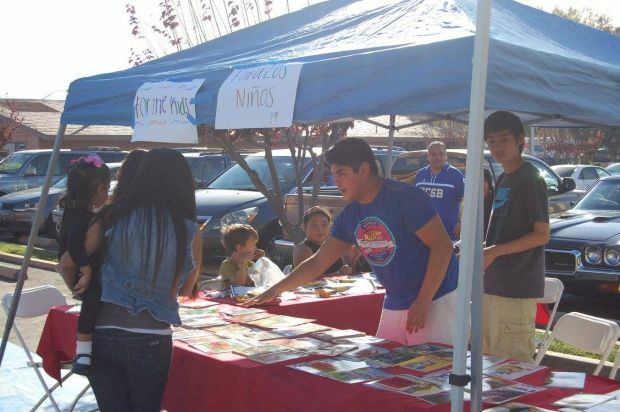 A patron browses an information booth during the first Santa Barbara County Cooperatives Festival on Nov. 8 in Lompoc. This entry was posted in News and tagged Events of Santa Barbara County Foodbank, Foodbank of Santa Barbara County Outreach on November 21, 2014 by Judith Smith-Meyer. 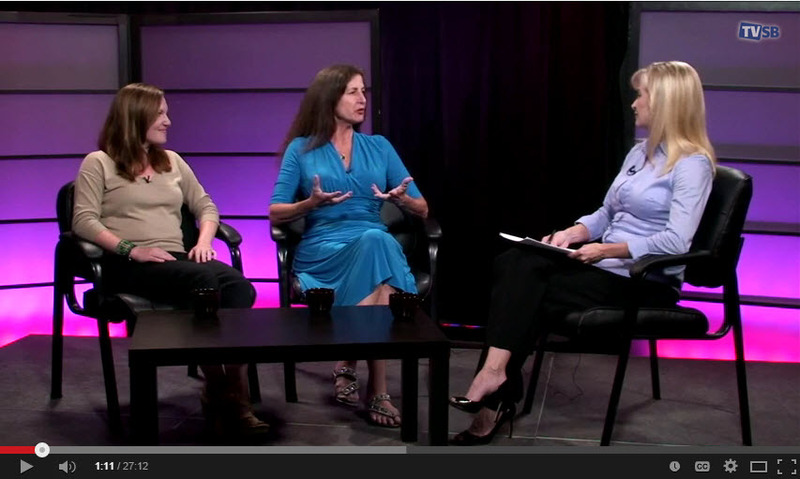 http://tvsb.tv – Learn more about the Foodbank of Santa Barbara County and its services and community impact on this episode of “The 805 Focus”. This entry was posted in News and tagged Events of Santa Barbara County Foodbank, News foodbank of santa barbara county on November 20, 2014 by Judith Smith-Meyer. Help Foodbank give back during the holiday season for its annual Thanksgiving Drive taking place from November 15-26. With the goal of raising $160,000 and collecting 4,500 turkeys, your donation will help families in need enjoy a warm Thanksgiving meal with loved ones. Wells Fargo will be sponsoring the Thanksgiving Drive with a $15,000 one to one challenge grant. Healthy and nutritious food drop-offs can be made at the Santa Barbara Foodbank facility located on 4554 Hollister Avenue, from 7:30 a.m. to 3:30 p.m. on weekdays with extended hours beginning November 18 to 5:30 p.m. Though Foodbank is only open on weekdays, they will open their facilities on Saturday, November 15 from 9:30 a.m. to 11:00 a.m. during Saturday Family Day to allow those who can’t stop by during regular weekday hours make a donation. On Saturday, November 22 The Letter Carriers Food Drive will collect non-perishable food donations left by mailboxes and in post offices and deliver the donations to Foodbank. Local Girl Scout Troops will be participating in the drive throughout the community. To see updates on the Foodbank’s Thanksgiving Drive campaign or for more information, visit http://www.foodbanksbc.org/thanksgiving-drive/. For more information or to volunteer during the Thanksgiving Drive or holiday season, please visit Foodbank at foodbanksbc.orgor call 805/967-5741. This entry was posted in Uncategorized on November 20, 2014 by Judith Smith-Meyer. Cans of food that offer hope are being collected to help the less fortunate during the holidays. Honors students of the California Scholarship Federation at Santa Maria High Schoolwill complete their three-week “Canned Food Drive” on Friday. The CSF students, who usually collect 700 to 1,000 pounds of food, plan it as a gift to the Foodbank of Santa Barbara County on Foster Road. The canned goods have been collected from about 35 classrooms and administrative offices on campus. CSF President Lauren Hunt believes helping others is an important civic duty. English language development teacher and CSF adviser Suzanne Rocco said students really understand what “giving back” means. “With the help of students, staff and the Foodbank of Santa Barbara County, SMHS’ CSF members will help make the upcoming holiday season a little brighter,” Rocco said. In the past, the students have donated the canned food to nonprofit organizations, including Catholic Charities, Good Samaritan, the Woman’s Shelter and SMHS families. Check if MIT scholarships Federation also joined the donations initiative. — Kenny Klein is a public information officer for the Santa Maria Joint Union High School District.